Washington, DC ― Venezuela’s crude oil production plummeted by 142,000 barrels per day in February, according to OPEC data, after the Trump administration recognized a parallel government in Venezuela on January 23 and imposed new sanctions on the country. For the six months prior to February, Venezuela’s crude oil production had fallen by an average of 20,500 barrels per day (see below). “This shows that the sanctions imposed by the Trump administration in January had an immediate, very harsh impact on Venezuela’s economy, and on the general population, which depends on the export revenue from oil for essential imports including medicine, food, medical equipment, and other life-saving necessities,” said Mark Weisbrot, Co-Director of the Center for Economic and Policy Research. 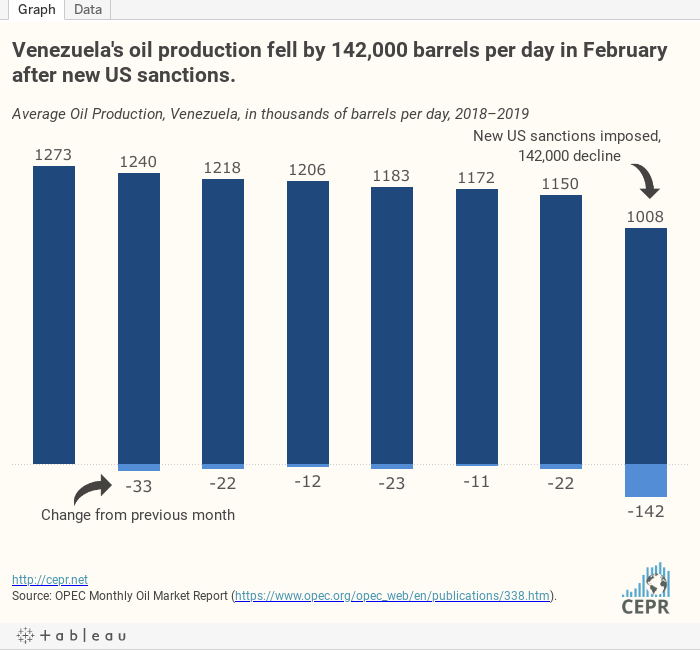 The loss of this oil production would be expected to cost Venezuela more than $2.5 billion in oil revenues if it remained unchanged over the next year; however, the decline is expected to get much worse over the year, due to the US sanctions. Total imports of food and medicine last year were about $2.6 billion. Weisbrot noted that US sanctions since President Trump’s executive order of August 2017 imposing a financial embargo had already rapidly accelerated the decline of oil production, wiping out many billions of dollars of foreign exchange, in addition to other negative impacts on the economy. On the demand side, imports of Venezuelan oil by the United States fell to zero for the first time, in the week of March 15, according to the US Energy Information Administration. This was down from 112,000 the previous week. In addition to the cutoff of US oil imports, there are a number of other deadly impacts of the Trump administration’s January announcements, Weisbrot noted. By recognizing a parallel government, Washington and its political allies automatically introduced a trade embargo on Venezuela in most of the markets for its oil. At the same time, Venezuela has been cut off from most of the dollar-based, as well as European, financial systems, further constricting its ability to even pay for the imports that it can afford with existing foreign exchange. This is because Venezuelan government accounts, including those of the Central Bank and of the Republic of Venezuela, have been declared by those governments who have allied with Washington to be the property of the parallel government that they have recognized, rather than the current government of Venezuela. While the Venezuelan economy was already in bad shape before US sanctions began, due to a collapse in oil prices and mistakes in macroeconomic policy, the sanctions especially since August 2017 have prevented the government from taking measures that could get rid of hyperinflation and allow for an economic recovery from a long depression. “The economic damage caused by the Trump administration’s January decisions will have a serious impact on the health, including mortality, of the general population of Venezuela,” Weisbrot said.